You can assign volunteers to the positions they serve in. This makes it much easier when it comes to scheduling volunteers onto a service. To begin, navigate to the user’s profile via Admin Area, and click on the ‘Account’ tab. Here you can see a ‘Volunteering’ heading. 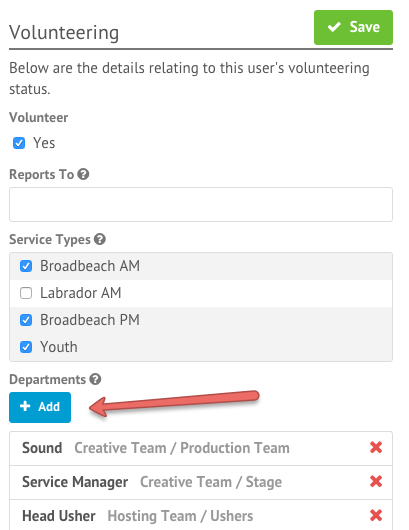 If the Volunteer box isn’t ticked, click on the box ‘Yes, this person is a volunteer’ and then select the positions you wish to assign your Volunteer to. To assign positions through the Mass Manage tool, bring up a list of people by doing an Advanced Search or creating a People View. Select the people you’d like to mass manage, and then scroll down to the ‘Mass Manage’ heading. From here, select: Change People’s Field > Departments > Add to and select the positions to assign the people to.